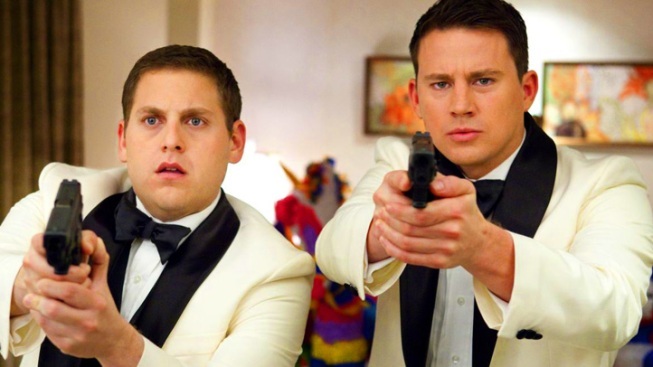 Jonah Hill and Channing Tatum Hit the Beat on "21 Jump Street"
At a time when Hollywood has recently seen the likes of Taylor Kitsch and Ryan Reynolds suffer miserable high-profile failures in an attempt to reach the A-list, it seems almost impossible that Channing Tatum, an ex-stripper, may emerge as this year's box-office champ. But with "21 Jump Street" taking in $35 million in its opening weekend, Tatum now finds himself the star of two of 2012's No, 1 films. Does he have something that makes him stand out from the rest of the Six-Pack Pack? Will he emerge this year as the next "Marky" Mark Wahlberg? Or is he fated to be the next Taylor Lautner? If he continues to manage his career the way he has of late, he'll be just fine. In February Tatum starred with fellow Nicholas Sparks alum Rachel McAdams in "The Vow," the story of a man who must win his wife's heart again when a head injury erases her memory of their relationship. It's a tired piece of gooey romantic trifle, a chick flick of the highest order. But since coming out on Valentine's Day it's been the second-highest grossing film of 2012, taking in more than $121 million. In "21 Jump Street" Tatum stars opposite Jonah Hill in an adaptation of the '80s TV show about young cops going undercover as teenagers, the same series that made Johnny Depp a star. They play a pair of baby-faced cops (under the command of a captain played by Ice Cube) who are sent to crack a high school drug ring. The film is both laugh-out-loud funny and strangely touching, as the plot takes the characters to naturally comedic places the old show was never smart enough to consider. Playing former high school classmates, the nerd and the jock, Hill and Tatum find youth culture has been unrecognizably changed – the cool kids now are into the environment and tolerance, while the jocks are derided as hulking nimrods and cheerleaders are persona non grata. Alex Pettyfer (front left), Matthew McConaughey (shirtless) and Channing Tatum (far right) star in "Magic Mike," based on Tatum's experiences as a young male stripper. Directed by Steven Soderbergh, the film opens June 29. Tatum first started catching people's attention in 2006, as the lead "Step Up," the surprise hit dance film which was a natural showcase for his ex-stripper talent. But there was something more than just beefcake that caught the eye of LaQuishe “Q” Wright, founder of the blog Channing Tatum Unwrapped. “He’s an extremely attractive guy. But the reason I named (the site) Channing Tatum Unwrapped, it was that whole message that you have a gift (Tatum), and it’s beautiful on the outside, but you never look on the inside, and that’s stupid. When people get to know Chan, there’s so much more on the inside. And at the time I didn’t know him, it was just this vibe I was getting, like, ‘This guy seems really real. This guy’s not affected, he seems really cool,” says Wright. “He was exactly the person I’d hoped. I thought he seemed like a really cool, down-to-earth guy who really cared about his family and (then) girlfriend… Just kinda down-to-earth and cool, just got lucky and fell into this acting career. I hung out on-set for nine hours, he’s in the middle of filming, I thought I’d probably just sit in a chair all day long and he'd just go about his business or go back to his trailer during breaks, and I’d still be sitting there, but no. He took care of me all day long, talking to me, checking in on me… I’d literally just met him that day. But that’s Chan,” said Wright. It's not just that Tatum's looks, but his type, that attracted others, according to Dennis Warner of Hollywood Life. Traditionally, actors (like Pattinson, for instance) have tried to manage their image to make them seem as unattached as possible, but Tatum manages to play both ends against the middle, winning points for marrying his co-star while still seeming like at least a distant possibility. "Since you don’t see them out a lot together, you can almost forget that he’s married – it’s kind of appealing,” says Warner. But with the exception of "G.I. Joe," which had a built-in audience, Tatum's most successful films have been, for lack of a better word, chick flicks: "Step Up," the Nicholas Sparks adaptation "Dear John" and the might-as-well-be-Sparks "The Vow." Luke Y. Thompson, who's been writing about film for more than a decade, most recently at Nerdist, sees "21 Jump Street" as a decisive step toward widening Tatum's fan base even further. Whether by luck or design, Tatum could be following a trail blazed by another shirtless wonder. "Jump Street" is Tatum's "The Other Guys," in which the hunk Wahlberg aligned himself with a talented comedic actor, Will Ferrell, making himself appear funny in the process. And now Tatum wants to take another page from the Wahlberg playbook. “He wants to produce pretty much everything from here on out,” explains Wright. “He wants to have his production company, Iron Horse, handle everything beginning to end. Their next movie, “Magic Mike,” is coming out this summer—they wrote it, they funded it, they got it made, they worked with Soderbergh…they took it from point A to point B." Tatum will star in the film as a dancer who serves as a mentor to Alex Pettyfer at a club owned by ex-stripper Matthew McConaughey. "Magic Mike" and "G.I. Joe: Retaliation" are both coming June 29, meaning he could conceivably have four hits on his hands this year. Throw in "Haywire," the low-budget action film directed by Soderbergh, in which he most notably took a beating from real-life MMA star Gina Carano, and the guy's even got indie/art cred on his resume. Tatum will go a long way toward establishing his crossover appeal with "21 Jump Street," and with the ladies already on board, just making men laugh like overgrown 12-year-olds should be more than enough. As Warner notes, "You don’t need to be a nuanced actor to be a success in Hollywood."